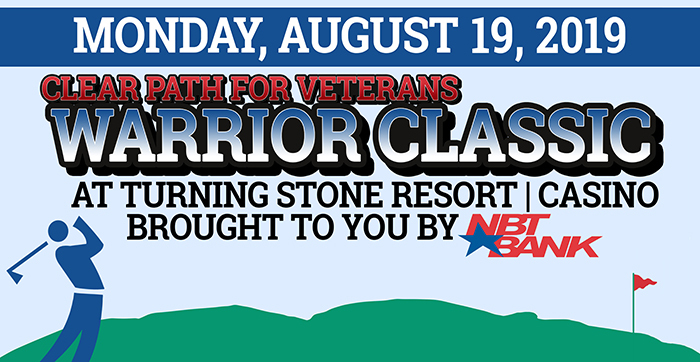 Participants in Clear Path for Veterans’ second annual Warrior Classic will enjoy a round of golf at Turning Stone’s new Shenendoah Golf Course. The Warrior Classic will be held on Monday, Aug. 19. Golfers will enjoy a continental breakfast starting at 7 a.m. before heading out to the links for a shotgun start at 8 a.m. Shenendoah offers 18 holes of PGA-level golf in a spectacular natural setting; the tournament will play captain and crew format. How can I find the Shenendoah Golf Course at the Turning Stone | Resort? Click on this link and then swap out the starting location (currently it is Clear Path for Veterans) for your preferred starting location. Following a dinner reception at 1 p.m., will be the keynote speech, awards ceremony and auction. Awards will recognize: best overall score, straightest drive and longest drive; there will also be a putting contest and a car giveaway for a hole-in-one. All tournament participants will receive a swag bag. Registration is $250 per golfer ($950 per foursome) and includes a round of golf, cart, swag bag, continental breakfast, lunch and awards. (For comparison, Shenendoah’s greens fees for 18 holes in the summer is $150 for the general public, not including a cart.) Designed, constructed and maintained to PGA Tour standards at more than 7,000 yards, the course offers conditions normally reserved for PGA Tour professionals. In 2006, the Shenendoah Golf Club was host of the PGA National Club Professional Championship. Alternatively, you can register for only the lunch and guest speaker for $35 per person. This tournament is made possible, in part, by the generous support of sponsors NBT Bank, N.A., which operates a network of more than 150 banking locations in New York, Pennsylvania, Vermont, Massachusetts, New Hampshire and Maine; DGC International, a project management company dedicated to solving local, national, and transnational challenges through a range of technical assistance to clients including: SRI, logistics and transportation, training and capacity building as well as global operations support; SAAB Defense and Security, which serves the global market with world-leading products, services and solutions from military defence to civil security; Premium Mortgage, one of area’s finest home loan providers and is Rochester’s third largest Veteran-owned business; NUAIR Alliance., a New York-based not-for-profit coalition of more than 200 private and public entities and academic institutions working together to operate and oversee Unmanned Aircraft System (UAS) testing in New York, Massachusetts and Michigan; and Voss Signs, LLC, which has produced screen-printed and digitally-printed custom and stock signs for various customers since 1965. Proceeds from this tournament benefit the programs and services at Clear Path for Veterans which touched the lives of more than 20,000 Veterans in 2018. Click the link below to download a Corporate Sponsorship Form.